I’ve begun writing the first draft of Iterationzero, so I thought I’d share some of its development progress. it’s been a great deal of fun developing this, the characters, their stories, and the universe within which they exist. It’s great to see how much the characters have changed from first thought to their current renditions. For example, Cameron was initially a Human who worked alone on earth, now she’s…something else and the commander of a small group out in space. Through the development of this first story, appearances changed and more characters were born, who then gave birth to even more characters whose stories exist outside of Cameron and her group. It all just keeps growing. Now that development is done, I’ve begun writing the first draft. Chapter one is done and I’m in the middle of chapter two, and as writing goes, things are still evolving. Characters are telling and showing me who they are as I write and they’re changing things up in a good way. During my Christmas time off from work, I worked on a series of new illustrations of Cameron featuring her without her team on a Solo Mission of sorts. It is such a joy for me as a writer to be able to relay what I see in my head to you through my directed illustrations. It’s rather freeing. Hope you enjoy the illustrations. 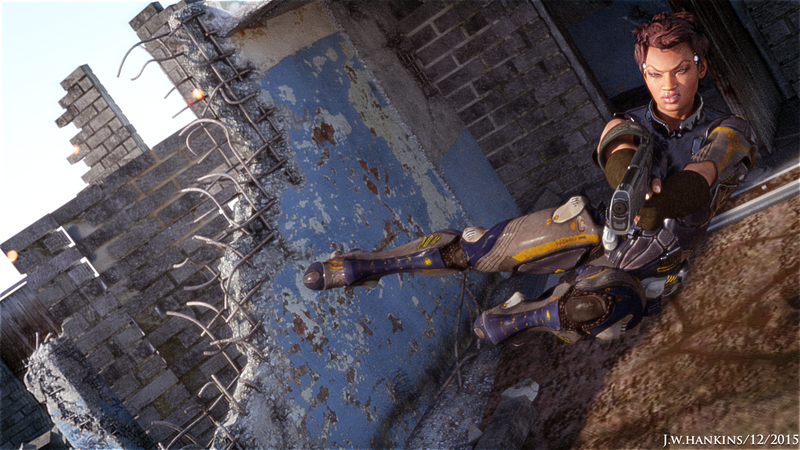 Ordered to clear the area of hostile forces, Cameron stalks a lone sentry. 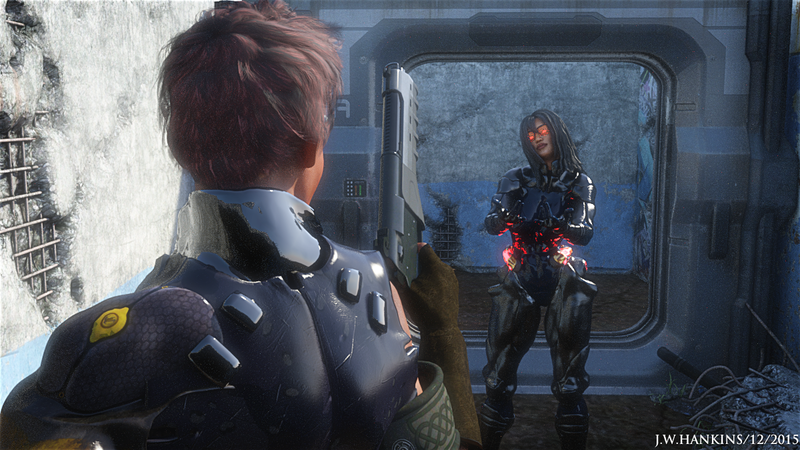 Somehow, an alarm is raised and Cameron stands ready to dispatch the guards rushing towards her. 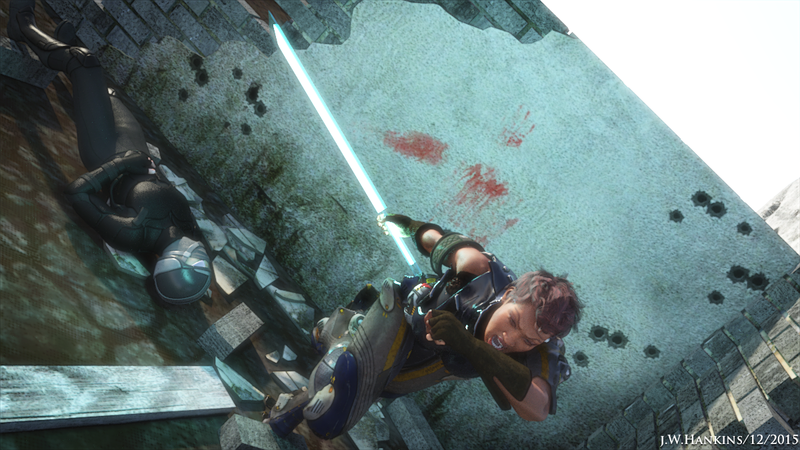 Focusing her psionic energy into a Telekinetic Blade, Cameron hacks and slashes her way through her enemies. Cameron finally locates the main entrance and dives into the corridor leading to the underground facility. I hope you enjoyed the illustrations as much as I did creating them. Look forward to more illustration series coming soon featuring Cameron’s teammates Vyra and Miyako on an individual level. Next Too Fast For Ya’ll!